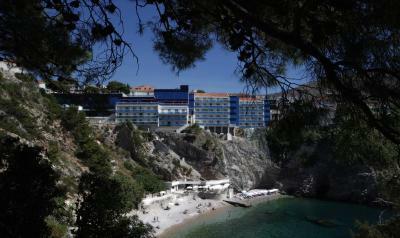 Lock in a great price for Hotel Bellevue Dubrovnik – rated 9.3 by recent guests! The view was awesome! Dinner and drinks were tasty. Wonderful breakfast, beautiful outside dining, wonderfull staff! Great restaurant for Breakfast and dinner. 25 minute walking distance from Old City. VERY NICE staff in every area, i.e. reception, house keeping, spa, and dining room. Great Sea view room. 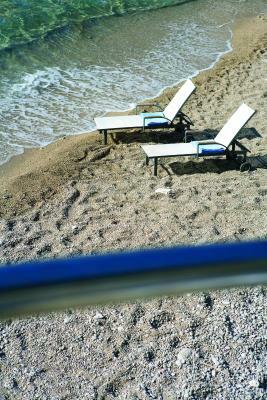 Nice beach for Croatia (not sandy). The spa was free, i.e., exercise facility, indoor swimming pool, steam room, and sauna. The hotel upgraded our room upon arrival, which was a great surprise. The hotel's beach was amazing, and the balcony looking on it was too. The entire staff was super helpful and nice. The concierge especially made our trip a dream. She recommended two amazing restaurants, helped us orient ourselves in the city so we could walk around and explore, and booked us a private tour of the Elaphiti Islands. The hotel is also perfectly located between the old city and the newer parts of Dubrovnik. It was no more than a 15 minute walk in any direction to explore three different neighborhoods. We would absolutely stay here again and recommend it to all of our friends! The views from the room were amazing of the Adriatic. Location was good about a 15 minute walk into town. The rooms were good size and the staff very helpful. Very clear! Overall great property. Everything was perfect! The friendly staff, the restaurant at the beach, Amazing spa and almost inside the beach!!! Excellent and consistent customer service, this is a team that understands the customer experience and strives to perfect it! A special thanks to Mato and Ivana at the front desk, you stood out, and made our experience memorable! I rarely write a review, but you deserve it. Stunning views from the moment you walk in, and all through this hotel. The location is a big plus, a 10 min ride away from the old city without the hassle of dragging luggage along cobbled streets. Hotel Bellevue Dubrovnik This rating is a reflection of how the property compares to the industry standard when it comes to price, facilities and services available. It's based on a self-evaluation by the property. Use this rating to help choose your stay! 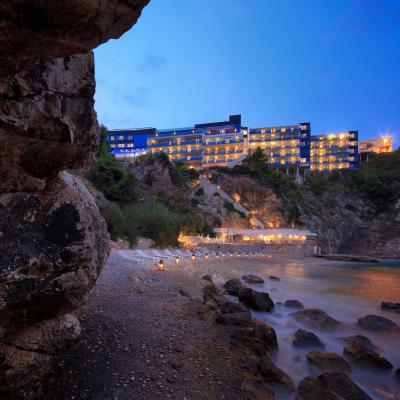 One of our top picks in Dubrovnik.Set on a spectacular cliff above Miramare Bay, the Bellevue Hotel offers splendid sea views from all rooms. Dubrovnik's old town is 0.7 mi away. 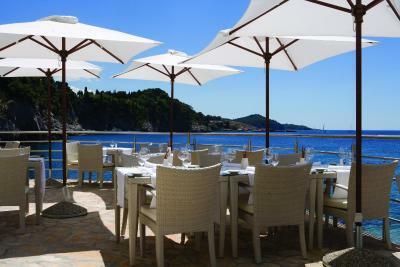 Hotel Bellevue Dubrovnik offers a lovely pebbly beach with the Nevera beach restaurant. The à la carte Vapor Restaurant serves a fusion of Dalmatian seafood delicacies and international dishes from Europe, Africa and the Middle East. The Wine Bar offers a rich selection of more than 180 domestic and international wines and sparkling wines as well as a wine tasting and finger food to match the selection. Guests can make use of the indoor pool with its superb sea view and treat themselves to a relaxing massage. The luxurious spa area has a Mediterranean atmosphere and features a sauna as well as a gym. Featuring a nautical theme, the Bellevue has air-conditioned accommodations with free WiFi, satellite TV, a bathrobe and slippers. Although the historic center of Dubrovnik is easily reachable on foot, you can also take a bus from the nearby stop. The hotel provides limousine and car transports to the city center and to Dubrovnik Airport, at an extra charge. 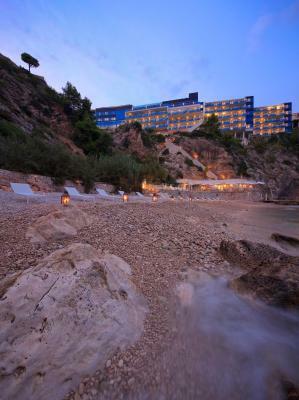 When would you like to stay at Hotel Bellevue Dubrovnik? Brightly decorated room featuring air conditioning and a flat-screen TV. The private bathroom comes with slippers and a hairdryer. This is a larger room with a balcony and sea view. This spacious room features a sitting area, and the bathroom has a shower and/or a bathtub. Spacious suite offering bedroom plus living room. Modern bathroom has a bath. All guests staying in this suite may enjoy 60 EUR worth of room credit redeemable at the Wine Bar. This suite has a satellite TV, seating area and mini-bar. House Rules Hotel Bellevue Dubrovnik takes special requests – add in the next step! Hotel Bellevue Dubrovnik accepts these cards and reserves the right to temporarily hold an amount prior to arrival. Please note that the rates on this website are quoted in EUR but that guests are charged in HRK. Rates are based on the daily exchange rate of the Croatian National Bank. The view from the balcony of my room, the access to the beautiful beach, the breakfast on the terrace, the friendliness of the staff, the wellness area, close to the Old City (I walked it in 15min), but far enough to be tranquil, the free late check out. Perfect. I had the best time. For a 5 Star hotel, the room was more standard than luxurious. It was spacious, and had a balcony with stunning views, but it didn't have the 'wow' that you get from the rooms in many hotels in Dubai or Hong Kong, for example. As one or two others have commented, there was no real atmosphere, or soul, to the hotel although that's maybe in part because it was nearing the end of the season and heading into a 3/4 month closure. Great location with direct access to a lovely small beach in the cove. The hotel and room were very clean and everything worked. Breakfast was good (but not great). The hotel is within walking distance of the Old Town and is very well served by local buses. excellent location, food and service. The staff were very welcoming and friendly, the hotel was always spotless, the food was excellent, and the extra touches made the stay at this hotel one of the best I’ve ever been to. It is close to all the main attractions and the private beach is wonderful. We had booked standard room with a sea view, but on checking in we were pleasantly surprised that our room had been upgraded to Room with a balcony. The room given was in the extreme right of the property and there was a cliff due to which there was hardly any view of the sea from the room, one had to go to the balcony to get the sea view. If any body visiting this property must avoid rooms with 1 in between the room number e.g. 414, 415, 416, 515, 516, 517 etc go for the rooms with 0 in between the room number like 404, 406, 407 , 506, 507 these rooms have a fantastic view of the bay, Really disappointed with the room view, wished that the staff should have given us better guidance while giving the upgrade. Attention to detail. Staff very friendly and attentive. Beatiful views accross the bay. Immaculately clean. Food of a very high standard. Hotel Spa was a bit limited and on the small side. Location, rooms, view and staff were super helpful. Hotel Beach was really nice. View from room was spectacular ! Just falls short of 5* standards sometimes. Depressing number of chips on crockery and glasses, should be checked more diligently. Coffee in pots at breakfast sometimes came with lids missing. Bathroom not always well cleaned. Fabulous position. Lift down to small beach - lovely. Fantastic breakfasts. Lovely view on patio. Extremely helpful staff. Lovely room and balcony. The cooked breakfasts could have been better but the buffet was good and really extrafood was not needed! Restaurant was overpriced for the quality of food. Portion size was small. Staff were very attentive and made good suggestions for things to do.